People across the city are getting a chance to “travel back in time” this summer thanks to Cardiff Bus. 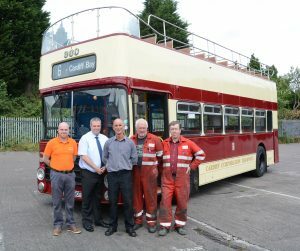 The bus operator, working with the Cardiff Transport Preservation Group, has helped restore one of its vintage open top vehicles from the 1970s, to run from the city centre to Cardiff Bay for the summer period. Passengers can hop on the classic bus, which features the celebratory tramways cream and maroon colours, and travel between St Mary Street, Wyndham Arcade, and the Wales Millennium Centre in Cardiff Bay. 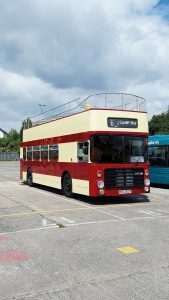 Starting from July 14 and running until August 27 the classic bus, which offers an open top view of the Bay, will run on selected dates on weekends. This is the first time the vintage vehicle has returned to the regenerated Bay – as last time the company operated a similar service the modern Cardiff Bay was about to be developed. Cardiff Bus commercial manager Gareth Stevens said it was an exciting opportunity not to be missed. He said: “We are delighted to be running the original Cardiff Bus along the bay route from this weekend. “At Cardiff Bus we are extremely proud of the role we have played in the city. For us, this was an ideal way to remember our own heritage while also thanking our loyal customers for all their support. “We would encourage everyone across the city to take advantage of this rare and exciting opportunity to travel back in time on a vintage bus, to visit all of the fun packed events in the Bay over the summer – starting with this weekend’s International Food and Drink festival. The vintage vehicle has been brought out of retirement thanks to the Cardiff Transport Preservation Group. The group, which was founded in 1992 and now has over 200 members, has restored the classic design to allow it to transport a new generation of passengers. Maintenance and restoration of the original model has taken place at the bus depot at Broad Street in Barry. Thanks to their dedication, the heritage bus’s original features including an original step to get on, classic glass panels on the top, and Cardiff Bus colours have been restored. Passengers can enjoy this classic service on July 14, 15, 16, 22, 23, 29, and 30; August 5, 6, 11, 12, 13, 18, 19, 20, 25, 26, 27. These days are subject to weather and vehicle availability and a standard bus may be used instead. The service will run daily between St Mary Street, Wyndham Arcade, and the Wales Millennium Centre, however on the selected dates the Open Top Bus will be used instead.